John A. White returned to his alma mater in 1997 as an “agent of change” to do all he could to make a difference for the state which had done so much for him and his family. He proved to be a man of his word. With an ambitious agenda from the moment he was named chancellor, White’s main goal was to realize the university’s vision of becoming the nationally competitive, student-centered research university that Arkansas needed and deserved in the 21st century. 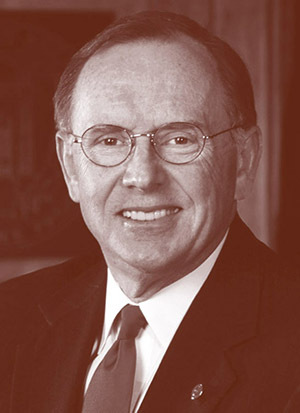 In reaching that goal he sought to enhance the university’s academic reputation nationally and ensure that the university was the economic and cultural engine for the state of Arkansas. Under his leadership, the university grew and improved by almost every metric. Scores on the ACT, the grade point averages of incoming freshman, freshman enrollment and retention rates, and six-year graduation rates all increased dramatically. The number of National Merit scholars nearly doubled, from 90 to 171. Research expenditures increased from $73.7 million to $113.8 million, and the university endowment grew more than sixfold, from $119 million in 1997 to nearly $900 million upon his retirement. Perhaps no achievement was more significant than the Campaign for the Twenty-First Century, a billion-dollar capital campaign launched in 1997 and concluded in 2005. The centerpiece of this campaign was the largest single gift to a public university in the history of American philanthropy: the $300 million gift from the Walton Family Charitable Support Foundation. This gift alone enabled the university to establish an entirely new Honors College, create an endowment for University Libraries and establish endowed fellowships across the campus. Prior to returning to Arkansas, White was dean of engineering at the Georgia Institute of Technology, where he served on the faculty for 22 years. His career in higher education and in management and engineering consulting carried him into the national ranks, including service as assistant director for engineering at the National Science Foundation in Washington, D.C., from 1988 to 1991. White earned a bachelor’s degree in industrial engineering from the University of Arkansas in 1962, a master’s degree from Virginia Polytechnic and State University, and a doctorate from Ohio State University. He also holds honorary doctorates from Katholieke Universitiet of Leuven, Belgium, and George Washington University. Personal: White was born to John Austin and Ella Mae White at Portland, Ark., on December 5, 1939. He married Mary Elizabeth Quarles in 1963, and they have two children.